Recipes to Make Tasty Crab Curry Practical -For those of you who like seafood cuisine, recipes curry crab which we discussed this time, could be an alternative choice in the food you enjoy lunch or dinner. It was a tasty and delicious as well as the manufacturing process is not too difficult is one of the main point why we recommend the seafood cuisine for you to test this one, especially if you are a big fan of seafood cuisine. 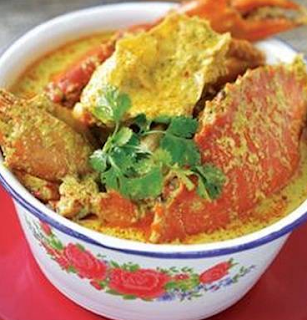 Curious to know how how to make curry crab that? The following is a recipe made that you can try at home practice. The first step, heat the oil. after the sauteed ingredients smooth flavor along with the bay leaves, lime leaves and lemongrass until fragrant. Next, pour the milk, bring to a boil. Then reduce the heat. After that enter the crab along with acidic water, sugar and salt. Then cook until cooked crab. After that angkatdan serve kepitng in the warm curry. 0 Komentar Untuk "Recipes to Make Tasty Crab Curry Practical"